excuse me while I lick the ketchup and mustard off my fingers. I feel like I’m standing at the State Fair of Texas where Fletcher’s Corny Dogs were first introduced in 1942. What? You didn’t know that? You’re dead to me now. Let me school you a little on some Texas trivia. Carl and Neil Fletcher invented the corny dog in their kitchen in Dallas way back in 1942, and that year they debuted them at the State Fair of Texas. It is reported, over 500,000 Fletcher’s Corn Dogs are sold annually in the 24 day period the fair is open. Totally insane! But what’s not to love about a beef hot dog enveloped in cornbread and then slathered with yellow mustard and ketchup? I love corny dogs, and I do indulge in a real one when I make it back home to Dallas for the State Fair. They sell frozen Fletcher’s at the grocery store, but no thanks. Just not the same. Wait! I have found a recipe that is as close as close can be without having eleventy-billion deep fried calories from a trailer in Fair Park. 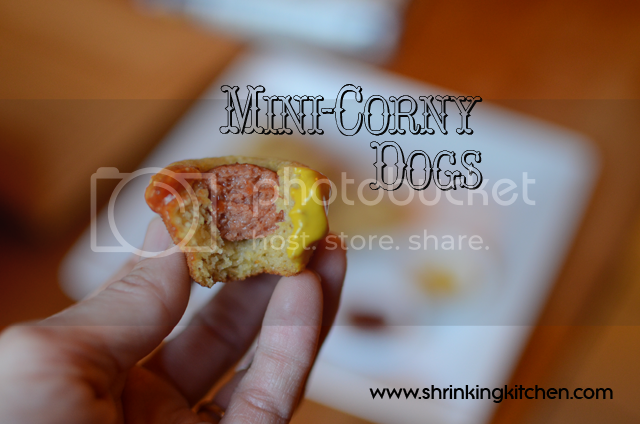 I present you with mini-corny dog muffins. Your kids will think you are a HERO if you make these yummy corny dogs. As a matter of fact, have your kids help you make them! Older kids can cut the hot dogs and younger kids can help measure, mix, and pour. These make a fun dinner, or a super-quick-theres-a-block-party-and-I-just-found-out appetizer! Make fat free buttermilk with a Tbsp of white vinegar in a measuring cup and then pour skim milk in the cup until it reaches the 1 cup mark. Preheat oven to 375 degrees. Combine butter, applesauce, and sugar in a bowl, and whisk to combine. Add eggs and whisk to incorporate. Add buttermilk and whisk to incorporate. In a separate bowl, combine baking soda, cornmeal, flour, and salt, and stir to combine. Whisk into wet ingredients in two batches. You can let your 4 year old do this. Trust me. They'll love you for it. Have your other kid (if you have one, and he's about 8ish) cut up the hotdogs for you. With all this help in the kitchen, you should kick back with a cold, adult beverage. I'm just sayin'. 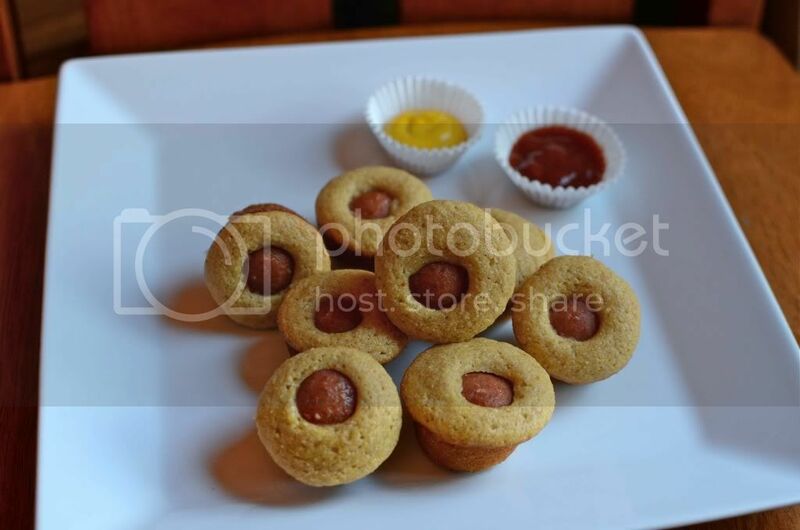 Spray a mini muffin tin with non-stick spray, and spoon 1 Tablespoon of batter into each mini muffin cup. Place one hot dog bite into the middle of each cup. I know some of them aren't perfect, but that's what happens when you turn an 8 year-old loose with a sharp knife! At least none of them are fingers! Bake for 8-12 minutes (oven temperatures vary), or until cornbread is golden brown. Each mini-corny dog has only 45 calories. To make Feingold Friendly, use Applegate Farms Beef Hot Dogs. They are awesome! This will change the nutritional values. Original recipe from Iowa Girl East. Her site is awesome! My kids are in love! YAY! Thanks for the fun dinner! We love corny dog bites. Gotta try this new recipe. Also, as a Pampered Chef consultant, your pictures make my heart happy! I made these last night and they were a hit with the entire crowd, even the husband! We’re munching on leftovers for after-school snack today. YUMMY!! !